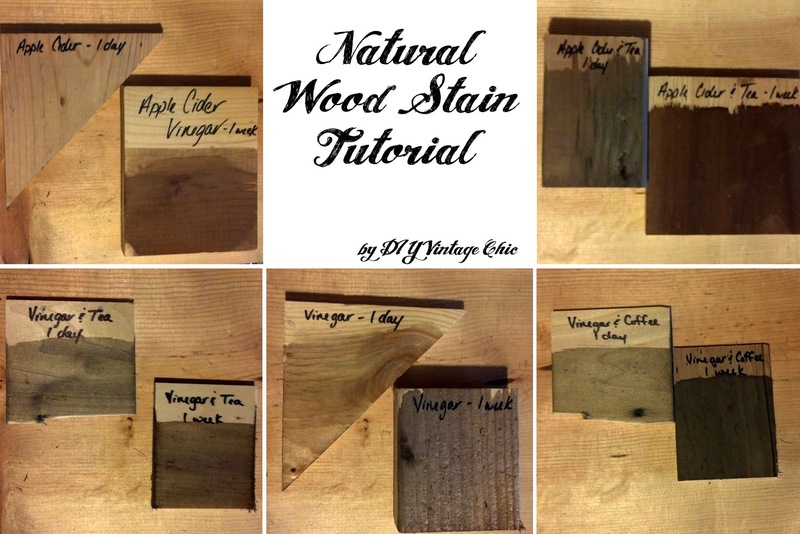 So some of you may remember my Natural Wood Stain Tutorial from earlier this spring. 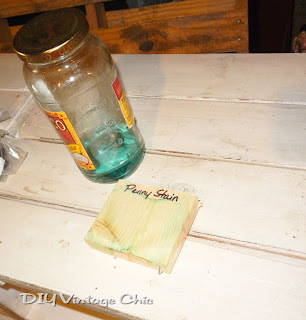 I demonstrated how to create a few stains you could create at home. Well at that same time I heard about a stain created from pennies and vinegar. So I thought I'd try it. I read several articles about creating this stain and the only ones that had any success had to use pennies from before the 70s. I tried that.... it didn't work. So here we are, 3-4 months after I initially started soaking my pennies. The hubby and I were busy cleaning the basement this weekend when I stumbled across this jar. I discovered I had left the pennies soaking. The solution looked like a much brighter blue this time. So I thought maybe that was the key to success! Hm. 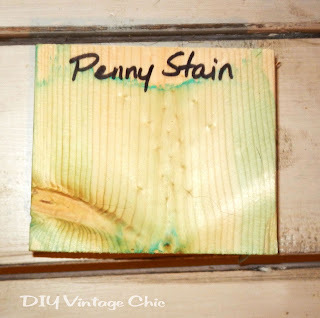 Interesting, i have never heard of penny stain. i'll be interested to see if you can find a workable solution! did you use hydrogen peroxide in the mix? I did not use hydrogen peroxide however a couple of readers have mentioned adding it. That's a bummer it didn't work out. That would be such a cool color of stained wood! I'm going to have to try again! Yes, but doesn't everyone love a good fail? Makes us all feel better when we aren't the only "real humans" on the internet. Found you on the crafty spice hop and the word "fail" drew me to stop by. Thanks Heidi. It is true. We all have a good fail. Thanks for stopping by! Becca I love that you shared a fail! Not too many people do that and its really encouraging to know that not everyone nails it the first time even when it looks that way! We have to be able to laugh at ourselves. Plus other crafters/readers might have a suggestion for me! Well Marty, I guess this is why. It doesn't seem to work. That's too bad, it's such a pretty shade of blue! Hmmm, interesting. In Canada they've phased out the penny, so I don't think I'll bother using what I've saved up to try this out! Nope, save your pennies Jill. I'll let you know if I find something worth using them on! Hopefully the red wine gets posted this evening! Stay tuned! That stinks it didn't work! I would have been a beautiful stain if it was just a bit darker. My thoughts exactly. Thanks for stopping by! I had not heard of penny stain. I'm surprised that it didn't stain hardly at all. Thanks for sharing with SYC. I am so horribly bummed that this didn't work. Poo. I've read about wood stains in fun colors, I guess I'll just go the safe route. Having tried the penny stain myself, I have been in the same disappointing boat. But along the way, I found out that you need oxygen for the reaction to work. A commenter on one blog suggested periodically exposing the pennies to air and then putting them back in the vinegar and repeating. I did this a few times with pretty good results (the pennies would get little blue spots when exposed to the air, and then that blue would tint the vinegar ever so slightly when you put them back in) but it was still obvious that it was going to take a loooooong time to get the blue I was looking for. And a lot of time on my part removing and replacing pennies. 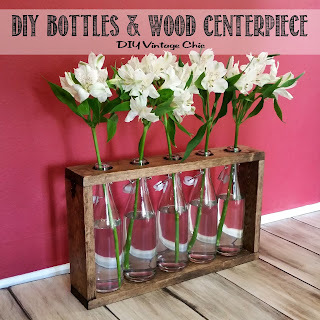 But then I came across the blog post of a successful penny stainer and learned from her that HYDROGEN PEROXIDE can be used as your oxidizing agent. This is IMPERATIVE to a successful reaction and to getting the desired results. Once I added the hydrogen peroxide to the vinegar/pennies, things really started to roll. My 1960's pennies immediately started fizzing and turning a dark brown, and the color of the liquid started to darken, acquiring an almost greenish-blue hue. My 1970's and 1980/1981 pennies took a little bit longer but were fizzing and turning dark brown after about 5 minutes. The author of the blog post said her's started to react within an hour. I had been heating my jars of vinegar on a skillet (literally 3 mason jars sitting in a skillet on the stove) on low heat, so that might have contributed to my sped up reaction. I had read in the comments of another blog that jewelers use acids to clean and polish metals and that they heat up their acid to speed up the reaction. Anyway within 15 minutes, I had three jars of opaque, murky but rich, bright blue liquid. The '60s jar was still a greenish color and the '70s and '80s jars were still that carribean blue, but all three were more concentrated with color. After about an hour I checked and the fizzing had stopped, and the liquids had cleared up (I realized that the murkiness from before was mostly from the fizzing). And I was left with these beautiful rich stains. I learned later (again from the blogger who found success with the stain) that before 1962 there were minute amounts of tin in pennies. They were still mostly copper, but I believe the tin contributed to that greenish color and possibly to the sped up reaction and success most experimenters have found with their 1960's pennies. And looking back I remembered that my 60's pennies (I was using just two) were from 1960 and 1961. 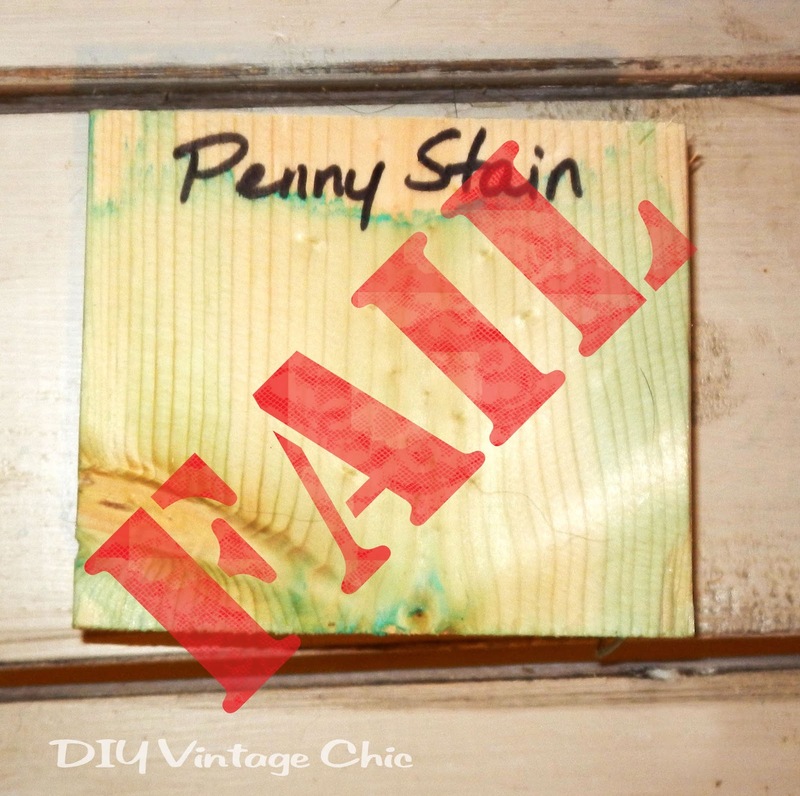 Anyway, the final test was how well my new stains worked on wood. I used the same piece of wood I had used to test my stains prior to adding the hydrogen peroxide, and where those stains had failed to show up in any way, even after a generous six coats, these new and improved stains delivered. 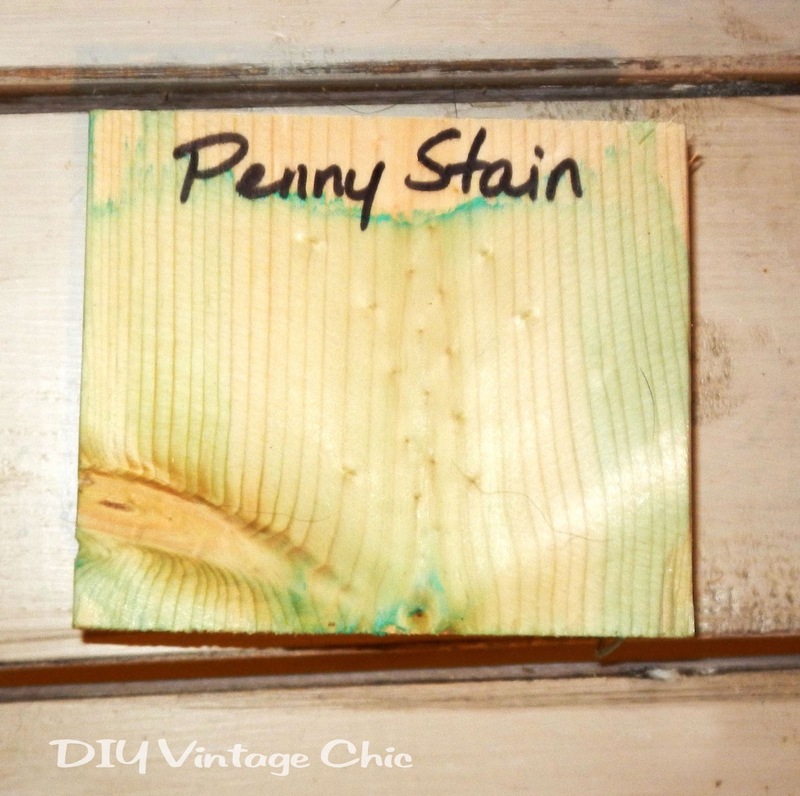 The 60's penny stain was a vibrant concentrated color after just one coat, and was less green on the wood. It took about four coats of the 80's and 70's penny stains to achieve the same look as the one coat of 60's. But all of them were successful in beautifully staining the wood. Something about the tin in the 60's pennies not only made the reaction faster but made the color more concentrated or reacted better with the wood. With the steel wool/vinegar stain, it's the tannins in the wood that react with the stain to produce the color. Maybe tin like steel reacts with tannins to bring out the color. I wonder if I could replicate the results using some of that copper mesh used in pest control. And since I have no idea how to acquire tin, maybe experiment with adding tiny amounts of steel wool and see if I get a similar result of a more concentrated color with just one coat. That'll have to be my next experiment! Obviously this is all just speculation but it proved to be a very interesting project. And more importantly a SUCCESSFUL one. So I encourage all who have been disappointed to give the addition of hydrogen peroxide a try. It will not let you down. Hope this helped! Oh my! Well I'll see what I can do. Thanks for all the info!!! Have you tried using copper wool instead of pennies? I know that copper wool oxidizes quickly and thoroughly (unfortunately for my metal sink!) just like steel wool and you can get it most places that sell steel wool. The pennies might not be working well enough because the actual copper content may not be high enough (I have no info on that it is just a guess). It may be worth a shot if you really want the blue stain... just a thought. I will have to give that a try! Great recommendation! I tried using a penny and vinegar combination once, and it didn't work for me either. but i did have quite a bit of success with one hundred percent copper dish scrubbers in vinegar. after one week i had a nice lovely blue stain. Add hydrogen peroxide to the pennies and vinegar. About 1 cup per quart..i eyeballed it after I realized you can't use just vinegar. I let it sit overnight and it worked great.